Conduct a flight from Burbank Airport (KBUR) to Fullerton Airport (KFUL) utilizing Flyways under the Los Angeles Class B Airspace. Review radio communications when operating at Class D and C airports. Fly from KBUR to KFUL while overflying KEMT and without entering Class B Airspace. Inform ATC on initial contact into KBUR that you are performing the CAT-9 Rating. KBUR is in Class C airspace. 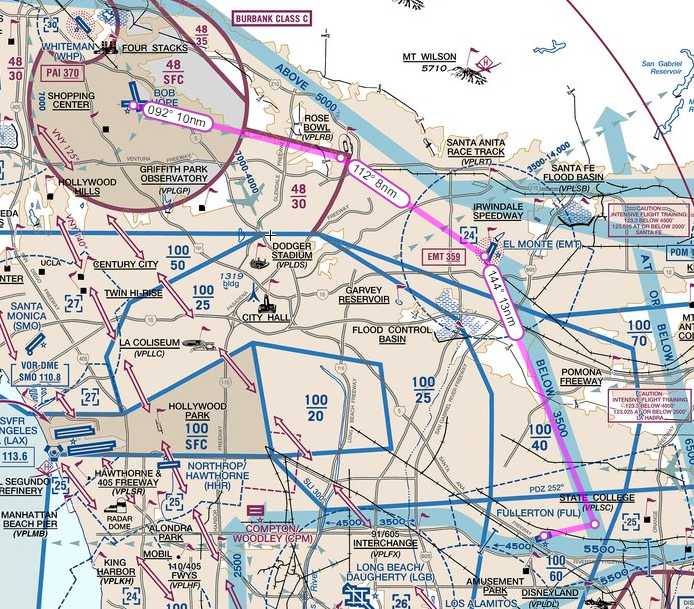 KFUL, the destination is Class D. While enroute, our goal is to fly underneath the LAX Class B airspace. Class B Airspace is the most restrictive type of airspace that VFR aircraft have access to. It is located around the busiest airports in the country. The dimensions of Class B airspace vary wildly from airport to airport, moreso than Class C and Class D airspace, but as a general rule it will extend around 30NM from the airport (however in some cases this is as few as 10NM and up to 40NM). Class B airspace normally extends vertically to around 10000’ MSL (however once again there is a large variance airport to airport). The overall view of Class B airspace can be described as an “upside-down wedding cake,” one of the more delicious metaphors in aviation. 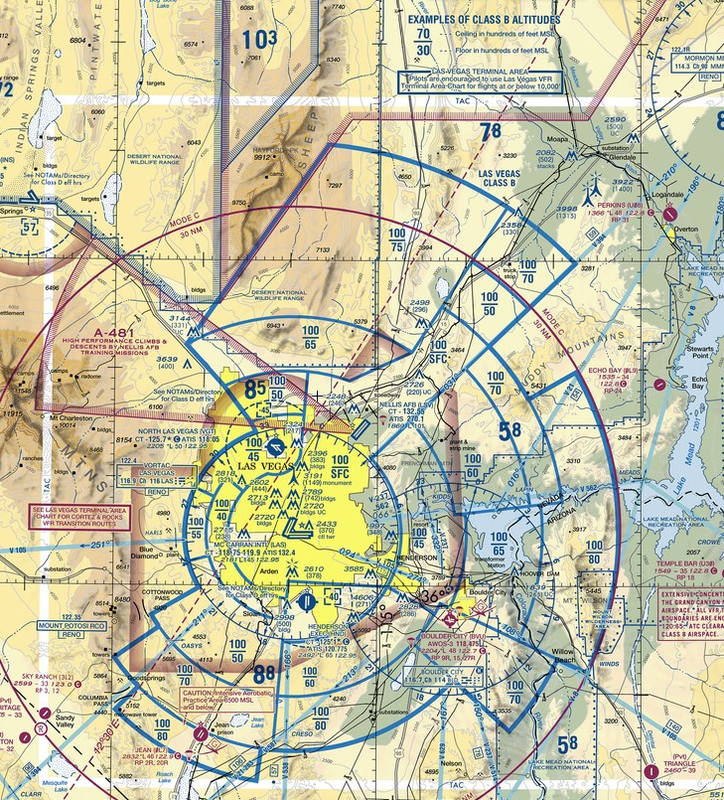 On VFR charts Class B airspace is depicted as a sold blue line and altitudes are depicted in hundreds of feet MSL using the format (ceiling)/(floor). To operate in Class B airspace you must have a working mode C transponder AND obtain an ATC clearance prior to entry. This clearance requirement is different from the traditional “two way radio communication” requirement. In order to operate in Class B airspace you must specifically be told “Cleared to enter the Los Angeles Bravo Airspace”, simply talking to ATC is not enough. In addition a “mode C veil” exists around Class B airports. Specifically all aircraft operating within 30 NM of the primary Class B airport must have and use a mode C transponder. Note this requirement is separate from the requirement to have a transponder in Class B airspace. This means if you are in Class B airspace, but beyond 30 NM from the Class B airport you still need a mode C transponder. The Mode C veil is depicted on VFR charts by a thin magenta ring. Due to the complexity of Class B airspace there are several ways to operate in and around it. One of them is the Flyway. A flyway is a general route that avoids class B airspace by either going around it or under it. Flyways are depicted on the back side of VFR terminal area charts. Each flyway will also have an altitude range to maintain. These are generic and will generally tell you to stay above or below a specific altitude. A VFR flyway does not enter Class B airspace and therefore does not require an ATC clearance or any ATC interaction at all to fly. Also around Class B airspace to help with navigation are VFR waypoints. These points are easily identifiable visual landmarks which can be used to navigate or as reporting points to ATC. These points are also given a five letter identifier (starting with VP) that can be inputted into a GPS to help with navigation. You can navigate along a VFR flyway using several methods. Note that depending on your simulator not all of these methods may be available to you. First you can navigate using visual reference points along the flyway. For example when you are over the Disneyland, you can navigate along the flyway to the Queen Mary by overflying the SLI airport. Second you can navigate by inputting VFR waypoints into your GPS. For example to overfly Disneyland you should input VPLDL into your GPS. VFR waypoint fixes are listed on the VFR flyway chart. Finally you can navigate using approximate headings and VOR radials that define the boundaries of the Class B airspace you are avoiding. For example after heading southbound from KEMT you know that once you are south of the PDZ 252 Radial the floor of Class B airspace goes up to 6000’. Once clear of the airspace you can resume your own navigation along the flyway and climb to your planned cruise altitude. Make sure to avoid all Class B, C, and D airspace. Switch to SOCAL Departure on 134.20.